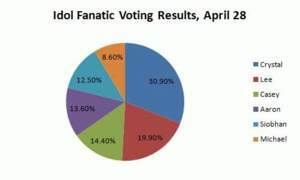 For the past three weeks, voters from Idol Fanatic -- a Facebook application that gives fans of FOX's American Idol a new way to cast votes online -- have accurately predicted the show's bottom three performers, in line with the 30+ million votes each week. Acting as a "redial agent" for voter phone calls, Idol Fanatic gives fans an alternative to texting or calling in their votes after the show. Rather than compete with busy signals or sending multiple text messages, American Idol fans can now log their votes directly through Facebook, while simultaneously engaging with other fans of the show. Based on last night's performance show featuring the songs and mentoring of Shania Twain, the voting results of the application's 1700 Fanatics point to Michael Lynche as the weakest performer grasping only 8.6% of the votes. His rendition of Twain's "It Only Hurts When I'm Breathing" met with approval from the judges; however, "Big Mike" is no stranger to judge/fan contradiction given the judges' choice to save him on April 7. By crooning a cover of Twain's "Don't," Casey James pumped up his popularity, moving him into the top three with 14.4% of the votes. Last week, Idol Fanatics ranked him in the bottom three with 7.8% of the votes. Consistent front-runner, Crystal Bowersox still reigns supreme as a fan favorite, holding the majority of Fanatic votes (30.9%) with her performance of "No One Needs to Know." Idol Fanatic is based on Ribbit, an open platform for building communications-enabled applications. Idol Fanatic is a free social voting application that allows fans to submit official votes for their favorite American Idol contestants through Facebook while sharing comments and results with friends. Idol Fanatic is powered by Ribbit, an open platform for communications innovation. Idol Fanatic is NOT affiliated with the FOX television network or American Idol.